Our research results are not our only impact on society. WU, with its students, faculty, and staff, is also actively involved in a wide variety of social projects. WU’s Volunteering@WU program is all about learning with and from each other. WU and corporate partner REWE have been cooperating in the “Lernen macht Schule” program since 2010. In this program, volunteers act as Study Buddies to help children and teens with their schoolwork in 16 different charitable institutions run by Caritas Wien (refugee housing, halfway houses for unaccompanied minor refugees, women’s shelters, counselling centers, etc.) and the Austrian Red Cross. While studying and having fun together, the kids both get help with their homework and also experience the students as positive role models. In addition to tutoring and recreational activities, WU students have also volunteered as summer camp counselors. These summer camp projects focused on creativity and the arts, mainly music, dance, and song. The success of the summer camps led to the development of the Music Buddy program. Working with music helps the children and teens improve their concentration skills, practice endurance, and learn teamwork – key skills for academic performance. 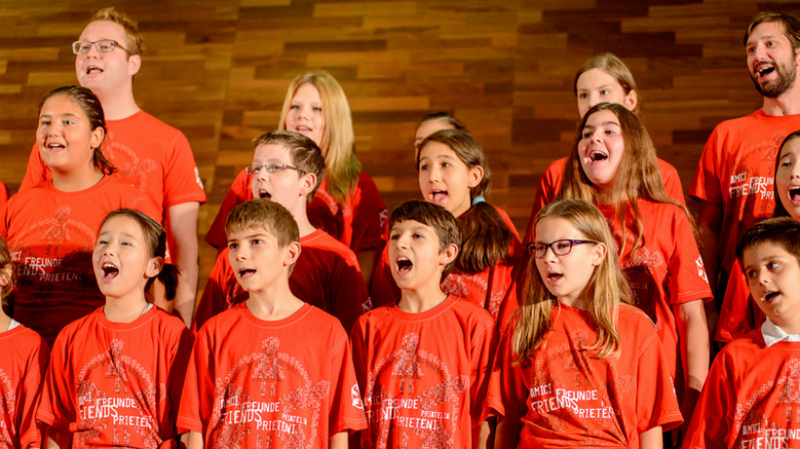 In the 2016 summer semester, volunteers rehearsed with choirs and dance troupes for a performance at the REWE Christmas party and recitals for families and friends in a Vienna open art center. Two million Austrians volunteer for charitable organizations, and 43% of Austria’s young people are active for social causes. In April, the first #YoungVolunteers Fair for teens and young adults was held at WU, organized by the Competence Center for Nonprofit Organizations and Social Entrepreneurship in cooperation with the nonprofit organization Freiwilligenmesse. 60 exhibitors presented their projects and initiatives in the WU Library and Learning Center. The fair was attended by 1,700 visitors. A panel discussion with distinguished experts Vice-Rector Edith Littich, Federal Minister Alois Stöger, Eva More-Hollerweger from the Competence Center for Nonprofit Organizations and Social Entrepreneurship, Michael Walk (Freiwilligenmesse), Alice Uhl (YoungCaritas), and Derai Al Nuaimi (Austrian Muslim Youth Organization) talked about the significance of volunteer work for society and the benefits for young volunteers. Informed consumers are able to budget their earnings and expenses and to provide for unexpected expenses or shortfalls. To do this, it is important to know the connections between and effects of one’s own decisions and those made by others in an economic system. Bettina Fuhrmann, head of the Institute for Business Education, has been working on improving financial literacy in Austria for years. In 2016, WU and the Austrian central bank, Oesterreichische Nationalbank (OeNB), launched a joint initiative to this end. In this initiative, WU and the OeNB conduct joint research, provide mutual support with each institution’s specific expertise, and promote the integration of financial literacy in educational materials like school textbooks.